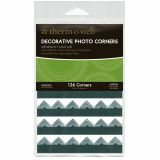 Decorative Photo Corners 126/Pkg - THERMOWEB-Photo Corners. Give your photos a professional look! This package contains 126 self-adhesive corners. Comes in a variety of colors. Each sold separately. Acid free. Imported.